Are you a Subscriber to Charter Spectrum?Why not own one router instead? If you are wondering if renting or owning is more beneficial to you, here is a comparative study which gives you the answer you are looking for. As a subscriber to the Charter Spectrum one may feel quite benefited above theother users of ISPs, as there is an apparentsense of victoryby thinking it saves you a lot of money. However, it might not be as rosy a situation as you think while renting or subscribing a router for CharterSpectrum. 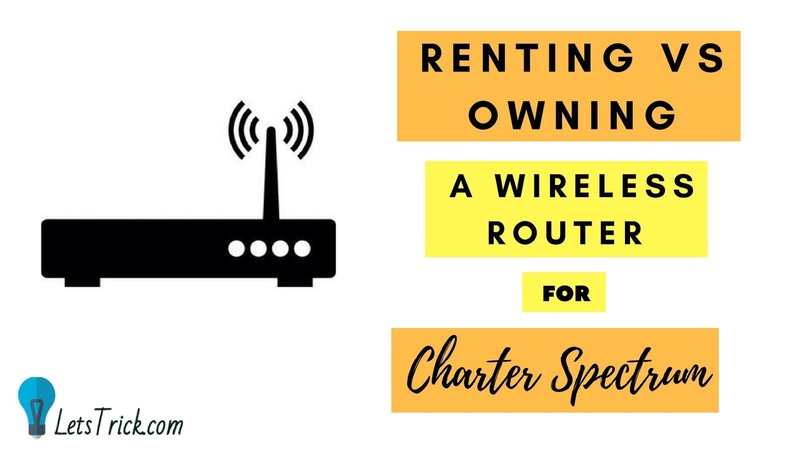 Though buying a wireless router for Charter Spectrum might appear as a costly affair, it is a one-time investment and benefits you in the long term. As by owning a router, you are free from paying the monthly subscription charges, you get to save every month and can easily recover the money you have spent for its purchase. If you are renting a router for Charter Spectrum, you can have the benefit of a router with a limited number of features. Whereas, getting one for yourself can bring you hordes of them like, latest wi-fi standards,beamforming,better wi-fi range,latest QoS andVPNs. That way your productivity increases with the built up of a strong network. Once you decide on buying a router of your own, instead of renting it, you are free to do a lot of things, which renting would not have allowed you. To get things done in your own way,especially when it comes to working with your wireless router and making the most out of it, the idea of installing your own DD-WRTfirmware could bring you the best results. It is one of the most popular router firmware available around in the market and you get access toan entirely open source. 3. Configure features like QoS. It is evident, that when you are renting a wireless Router for the Charter Spectrum, you cannot expect the ISPs to invest a lot of money to buy the best routers for their customers for the purpose of renting them out. So when you are a subscriber, in most cases the routers will be outdated, from which you cannot get the best networking performance. If you still choose to rent, make sure you upgrade your old wireless router from Charter Spectrum. But when you are going to get your own wireless router, the same caution applies to you, as you might end up buying a router with good features but is not the latest one. In that case you are again at loss. So be careful while making the purchase. Check out the latest updates on the routers and then choose the one, which suits your purpose the best way. But before you go ahead, you need to remember, that the installation of a new firmware on your existing router needs a proper setup. A small mistake while rendering the setup can make your router can make it defective. So, make sure of each and every technical aspect to be in place before you install the firmware. The features and functionality of the wireless routers are upgrading every now and then. To be with the flow, you get a lot of options and benefit from the progressive latest technology. While renting a router can also be a smoother option for you today, buying one for your home or office would definitely give you a better opportunity to utilize the connectivity options. As you become independent, the strength of the network you build can grow with the same pace.